But what do you mean the real return? As in a real cotinuation like the sneak peak we saw on Faraci's twitter? Yes, that the continuation to PKNA/PK2 will still happen and the things in Universo PK will be entirely separate to that. See this mini-series as a chance to revisit the original PKNA issues to "re-familiarize" yourself with the PK universe, albeit with a new twist. It seems to me to come down to how things would have happened if Ducklair never came to Earth, but that's just what it seems to me and is pure speculation. 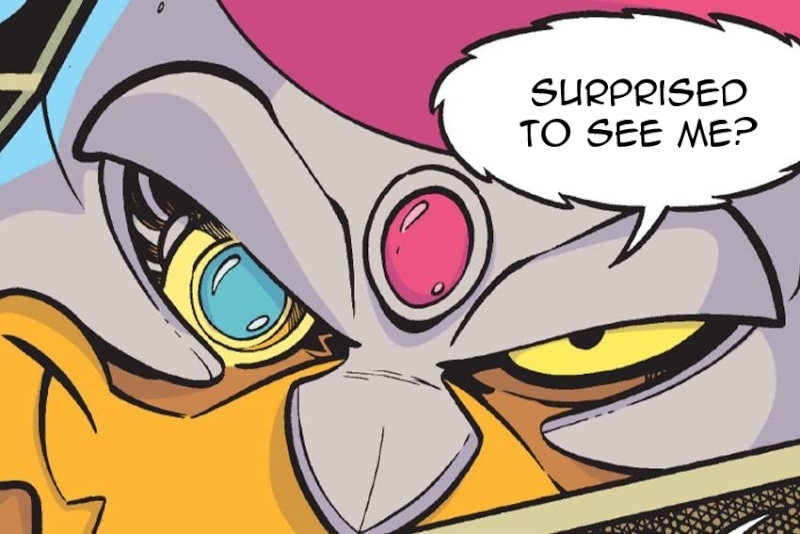 As Blotling said, "Universo PK" is basically the PKNA stories without Uno's help and more in line with the feeling of the classic stories(there will be more Scrooge and Gyro will be PK's arms dealer), as the solicitation claims it will have a more comical tone. I think PK will simply not bothering counting the floor of the Ducklair Tower and then going from there. Yay, that's really neat, I'd love to read these stories. Since I like old and new PK, I'd most likely enjoy it a lot. Here's hoping Ehapa considers this mini series for their "Enten Edition" subseries of the LTB . Do we have any for sure dates? Paperinik: Universo PK will come in the next issue of Paperinik Appgrade, which is due sometime early January, afaik. So it's soon, *very* soon. Paperinik Appgrade #16 is out in Italy. KrisTruama told me he was trying to get his friends to send him scans of Pk Universe so he could translate, but I don't know how that's going. Hopefully we can get scans from someone. And here I've read the first PK Universo story. Yeah, there are now scans available on PK HACK. Nice to see some Evronians again. Oh, and it states in your face that all that PKNA and Pk2 stuff all takes place in an alternate reality. I wonder how he's going to survive the fight against the Evronians with only Gyro's gear. I don't care if it's alternate reality without One or the shield, I'm fine with it if it has Xadhoom. Provided it's decently written, of course. I am the happiest woman in the universe!! Eeeek! I'm in Italy, when it starts! LUCKY!! I´ve always had very good luck with PK but THIS GOOD?!? No way!! It will be out July 2 on"Topolino" 3058 . It will last four issues , writer Francesco Artibani, artist Lorenzo Pastrovicchio. Only 4 issues? Well, I'm hoping they're just testing the waters for another longer series. And that the waters are suitable. I think it's going to work like how they make it work with Doubleduck. One single story in four issues, then another story after some time that takes from 1 to 4 issues. I thought we were done with the Evronians already. Not that I mind, especially as it seems we'll see PK teaming up with Raider again. Love that team up, Raider is a great antihero. It's about a future that wasn't meant to happen, so probably we're still done with them. in the trailer Pk says "you...you betrayed me" . Who this "you" could be ? Trailer? OMG! I can't wait to buy Topolino 3058 where it starts!! (Oh yes, I'm in Italy from June 27. to July 4.) LUCKY!! Here's an image that intrigues me. I recognize a bunch of old character art, but that Odin Eidolon image... that's new and looks to be in style with the other images we've seen, which of course looks like the DoubleDuck style, which is not a bad thing, DoubleDuck looks great. Anyways, looks like we're gonna get some Odin. Edit: We're gonna get more One and Odin? Yes! The one thing I always disliked about PK2 is that they did away with One. Yeah I noticed that new Odin and I'm SO GLAD we'll see him because he also means ONE... and TIME STORIES! !